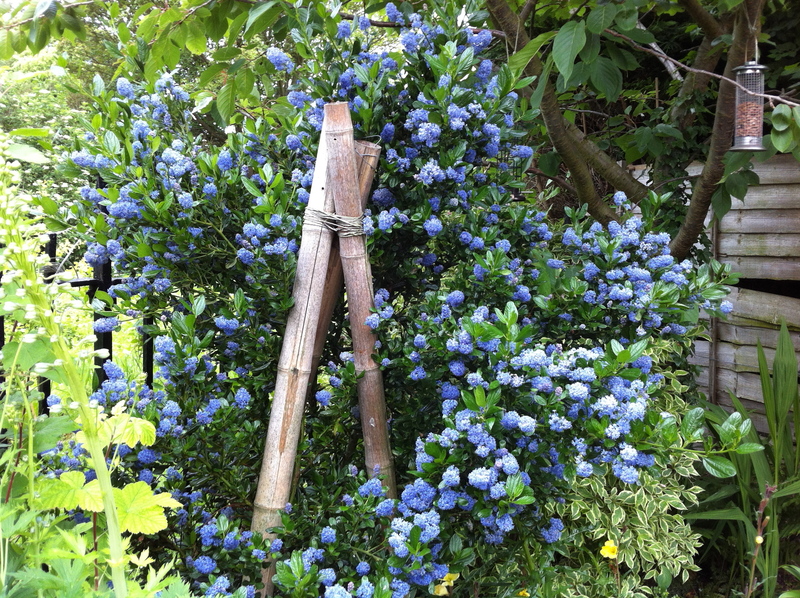 We have a ceanothus (or California Lilac – unknown variety) that now has bright blue blobs of flower all over it. I’m not sure if it supposed to be a prostrate ceanothus, but we’ve convinced it to grow upwards thanks to the rather sturdy bamboo log tripod that once towered over it. I fear it wont be long before it is the other way round. I like the way the ceanothus seems to be spiralling round the tripod, we haven’t really trained it, it’s just ended up growing that way. I am a little concerned that it is going to get too big, especially given the size of some of the ceanothus trees we have spotted. I will need to cut it down to size towards the end of the season, but for the moment, it does look glorious and the bees are all over it.